After my nogi match, the girl apologized for sitting on my face for most of the round. I couldn’t think of a reply fast enough — my head was still a little fuzzy from suddenly getting all the blood flowing back — but I realized later that she’s much lighter than the guys who normally sit on my face. I had a lazy/non-intense approach to my matches at tournaments. I wasn’t “on” and ready to rumble. I was nervous and had adrenaline pumping, but was much more “flight” than “fight.” This could’ve been caused by not warming up much beforehand, which was mostly because there wasn’t anyone to work with; all the guys were competing at the same time. Some things to work on for next weekend. I need to take someone to chauffeur and/or someone to take pictures/videos next time. I don’t have any more pictures or video of my matches. (Not that videos would’ve been terribly exciting or informative this time — first match, I was under mount; second match, I was under side control. Hey, wait, those sound familiar…) Or, as I did for the awards, ask someone on the side to take pictures. Didn’t even think of it until then, though. My neck still hurts, though not as badly. Mostly just stiff. My knee is also hurting. If I did anything to it during the tournament, I don’t remember it and didn’t feel it. I think because of those aches, though, I’ll try to take it easy at class this week (which is just Tuesday and Wednesday for me). 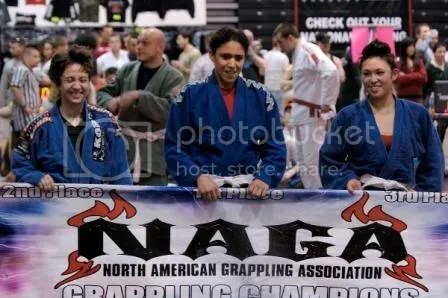 Not NAGA, but a NYC lawyer used BJJ to subdue a drunk guy who attacked him. Update: if you read the post comments there (most are rather ignorant, however), at #88/#89 the lawyer himself posts. He says he eventually got the guy in a RNC and alternated nearly sending the guy out with letting off the pressure until the cops arrived. And he says that the video was originally longer, but that he edited it down. (I was wondering how the cops got there so fast!) All that part of the RNC is behind the counter, so it’s mostly cut. There are also more comments by the lawyer on the original YouTube page. Note to self: do not drive down — and then back — on the same day of a tournament. Is not pretty. I woke up this morning and then drove down to Charlotte. Took me nearly 3 hours. Not recommended. Weighed in at 123 even. That was in my nogi gear, instead of street clothes and shoes like I did last time. So I was probably 3 meals away from 119. I think I will definitely make a run at getting to near 119 for my walking-around weight; I think I can do it. The guy told me when I weighed in — and he was writing it down on my Intermediate nogi card — that there were lots of girls in my division. I think there were 10, if I’m doing my math right; the girl who won had 4 matches, I think, in that division. Got there, and two of our teenagers were already competing. One had actually just won his division; the other had one more match, and then he also won. Sat up with Clifton’s girlfriend and Brandon’s wife and took some pictures. Because they were actually moving through the divisions, they called all women competitors for nogi and gi to turn in our cards. So I grabbed all my stuff and headed down to Ring 1, where I camped for the rest of the day. Still took them a while to get to us, but that was okay. I did actually eat today — protein bars — and had both Gatorade and water. So I wasn’t about to pass out like NAGA VA. Remember to eat: your division will always be later than they say. Most of my teammates were competing at the same time. I got some pictures from my vantage point, though I was generally far away. None of the guys were able to corner me, though, since they were all competing or cornering each other. But for several of them, it was their first competition, so they needed it more. First nogi match, finally. Angela, I think, and I think she’d already competed in the Masters’ division and won. (Hadn’t paid too much attention, though.) We locked up, and you know how you can just tell that someone really knows what they’re doing? Yeah… She pulled guard, so down we went. I was fighting to break it, though wasn’t very effective. I heard her coach walking her toward a triangle, so of course I was trying to avoid it. She got a higher guard despite my efforts and then swept me, so she got 2 points. She ended in a higher mount; I had one elbow trapped under her leg, and was grabbing the other hand and bracing back toward her hips. Her coach started walking her through getting that triangle. It was kind of odd, though — he was giving really specific instructions like, “Pull on her head with your right hand” or “Push on her elbow with your left hand” or “Move your left knee forward 2 inches.” I remember sitting under her and thinking, “She seems really competent, so why are you walking her that minutely through this?” And she wasn’t doing anything unless he told her to. It was… strange. I kept trying to bridge and/or brace my arms against her body, but I couldn’t get out and she wasn’t finishing it. (It felt to me as if she could’ve finished it on her own, but her coach wasn’t giving the right instructions.) We ran out the clock, and she won on her sweep. During one match — once we got to gi, I think, or right before — a girl got her elbow popped out. I didn’t see it, thank goodness, but they had to stop all action on our mat and bring over the medics. I think they took her straight out to the hospital. The girl who was fighting her felt horrible. On to gi. First girl (Dianne? Dianna? ), I grabbed on to her and pulled her down. Got guard, but then we went to grip fighting. She was extending her arms, and several times I thought about trying for armbars, but for some reason never did. Opened my guard to try to sweep her at some point, but couldn’t get it off. Then couldn’t get back to full guard, and she eventually passed, so 2 pts to her. Under side control, and couldn’t get out. Her corner eventually pointed her at the far-side kimura, but I was able to defend it, though was still under side control. But then time ran out, so she won on her pass. I’d already decided that for this last one I wanted to grab on to her and have her think, “Holy moly, she’s strong!” Grips felt good and strong. We headbutted a little on accident when we first closed in. Pulled her down; didn’t land in guard, but eventually got back there. Unlike the corner that was telling the girl what she should do in minute detail, this girl’s corner was telling her what not to let me do… which is of course my clue that something is available. “Don’t let her grab your collar” = grab that collar. “Don’t let her get that triangle” = triangle? Where? Oh, there! Mine. Had it locked up within a second of her corner announcing that it was there. Then he said, “Don’t let her roll you over.” Roll? There’s a roll? Oh, that way? Oopsy-daisy. Her face was turning purple, but she kept trying to fight it. Got the underhook and the angle, and then heard someone yell “Hug your knee!” (though I’m not sure they meant me); hugged my knee and her head and she finally tapped. I grabbed my stuff and trekked around to where Brandon, Clifton, and Adam were. Got there to see Adam win his nogi division. Then we watched one of our guys on the other side choke his first gi opponent out with a triangle; the guy didn’t tap. (Don’t know if he did it on purpose, or just thought he could keep fighting.) We watched the guy’s free arm go limp, and then his legs went, and then our guy looked back at the ref and said something (presumably, “I think he passed out”), at which point the ref ran around and checked and called the match. Once everyone from our team was done, Adam and I headed back home; the other guys are staying another night in NC. Remind me again not to tack on so much travel — or at least to take a driver with me! I only jerked girls down toward guard and didn’t actually do any takedowns. But, I did feel more comfortable standing up (though I did want it on the ground as quickly as possible). I need to work my grip strength more. Forearms were shot after the first gi match. I did actually grab the other girls’ gis! And pulled the fabric around. Okay, so I didn’t do anything brilliant with it, but I did start working with it, which is a step up. Did somewhat better on the adrenaline rush — and letdown — and did better about keeping hydrated and fed. Still took too much stuff, and forgot the ibuprofen. Is important. I’m taking Monday off to take a friend of mine out for her birthday, which is actually today. As of last week, it was just me and Clifton going to US Grappling’s Submission Only next weekend. But Clifton’s been working on the guys this weekend; now Yoshi’s talking about coming, too. I’m definitely going to work a way to get off early on Friday and head up for weigh-ins, food, and rest. And then I’m taking at least a full week off. Maybe get a few more massages. Videos and pictures coming once we get them off the camcorder (my mom has never embraced digital media, so it’s on a tape still) and the camera (my uncle, thankfully, is a media director, so he likes digital media and took lots of pictures). We went to weigh-ins last night. I weighed in fully dressed, holding stuff, at 126 lbs, so the guy listed me at 125. Everyone had told me lots of things about what to expect, but what they forgot to tell me was that all the guys — and some girls! — would be stripping down for weigh ins! Wasn’t even paying attention, walking in with my guys, and I look up to see lots of guys in boxers. And a few girls who stripped down, too. Then we hit Cracker Barrel for lots and lots of food. Next morning, got there around 11 a.m. Way. Too. Early. Adults didn’t even start until 1:30/2 p.m. So I had way, way too much time to be nervous and have adrenaline running through me and to think. Did have my iPod with lots of reggae (Christafari), but that didn’t help much. Plus they were switching some of the divisions around on my mat, so I wasn’t sure when we were going. Got ready a couple of times, and they didn’t call us. Ugh. Did roll with Scott on the warm-up mat when it seemed as if my division would start soon. He said I’ve never rolled like that before and said to keep it up. Awesome. But then another long wait before the nogi absolute for him and even longer for the women’s nogi. And even once we finally turned in our cards, there was still a long wait because some of the women were asking if the divisions could be switched around somehow. One whole division was all women from the same school, and they apparently always have to roll against each other at tournaments and were hoping something could be done. So a long time of waiting on the edge for the divisions to start. I don’t even know what was finally decided. First round, I was intent on taking her down and finishing her. I was ready to be aggressive and I knew she wasn’t my friend. But I did underestimate her — and, really, all girls. She was fast and strong. And, my clinch and takedowns stink. The crucible has returned its verdict. As we were grip fighting, I thought very strongly about pulling guard at one point but thought I could take her down. Wrong. I think I lost my balance or tripped over my own feet or something. — Update: watching the video, she pulled me around and I tripped; she jumped forward and landed on top. — Fell, she gave a little guidance to send me to my back, and she landed in a triangle. She had it fast and tight. Tried to get out (seriously thought about tapping early but kept fighting; even gurgled at one point because I couldn’t breathe). 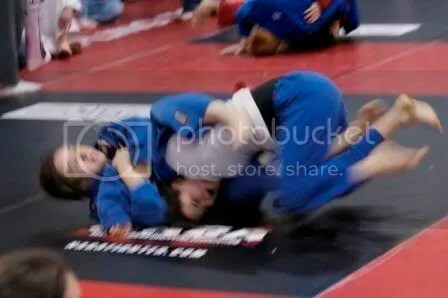 Started to posture up at one point and actually stood, but she came off the mat for my head and jerked me back down (the ref said something about not slamming, but I had nothing to do with it — she pulled me). Eventually realized she had me and good, so I tapped. The ref didn’t even see it, but we were both good sports about it; she let go and I stopped. Was light-headed and dizzy afterward; that thing was tight. She had long dancer legs, and they were strong. Six-member bracket, so that was my only round there. Disappointed in myself; knew I could have done better if I’d been able to get her to the ground on my terms. But learned several things there. EAT. Your division will be later than you think. Long wait until gi. Watched several of my guys. They did well, too. Jesse won 2nd and 3rd in his nogi and gi divisions. Scott was 3rd in his nogi division. Big John, the former wrestler who’s only done 3 months of BJJ, won 3rd in his weight class, nogi intermediate division (they bumped him up from Beginner); Buddy #1 won 2nd in the same. Nick was 2nd, also, in nogi. Saw glimpses of Buddy #2 rolling across the gym, but don’t know how he did. Was watching Scott, John, and Buddy (same mat, different divisions, though they overlapped them to give guys time to rest), and suddenly saw two girls in gis and white belts standing on mat #1. Booked it to get down there. Same mindset as before, with an edge of revenge for the nogi round. I was in the third round. (Noticed that she was wearing the Atama women’s gi. Meant to find her afterward and ask her how she liked it, what size she had, and if it had shrunk, but lost her.) Learned from my first match that I wanted to be on the mat now. We locked up and I pulled guard as soon as I felt I had her off-balance. So fast, that my uncle got no pictures of it and my dad took a few seconds to realize I’d gone off the screen on the camcorder. I’ll have to watch it all again to remember what I was thinking and doing, but I hit a sweep from guard (2 pts) and then mount (4 pts) twice. Kept trying to hit the americano from there, but must have had something wrong. Several of my guys were competing at the same time, so no one was able to corner me. Instead, I listened to her coaches and tried to prevent what they wanted and do something else. Went all four minutes, and I won on points, 12-0. 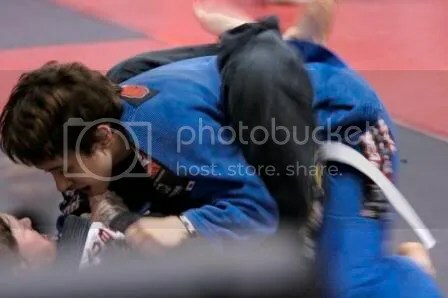 The ref talked to me for a second afterward and said that I was a different person in the gi. I said that I hadn’t ever really rolled with girls and had underestimated the first one. He was a nice guy; kept telling us after each match that we’d done well and he liked what he was seeing. Next round, same beginning: locked up and pulled guard. Again my uncle got no pictures of it. Adam and Scott were there for this one, and they walked me through the round. Had a sweep, I think, and some other things, and then a bump sweep (Scott yelled “Sit-up sweep!”, which took me a second to recognize, but then hit it) to mount. She was pushing straight up on my chest, so I was thinking of the armbar. Didn’t get it at first, and she pulled her arms in and was starting to bump me around, so Adam told me to grapevine her legs. She pushed on my chest again, and I hit that armbar like butter. (Even thought as I hit it, “Oh, that was nice.”) Tight and deep, and she tapped. That put me in the finals. Oo! They started the next weight class so the other girl and I could rest. I was exhausted, mostly from being on an adrenaline rush for so many hours. And my grips were shot. Forearms were rough, too. Never quite caught my breath before the finals. Last girl was taller and bigger than me. I think she really cut to hit under 135 lbs. I’d seen parts of her earlier matches, and she also looked strong. She grabbed my sleeves, and I thought, “Holy cow!” She was even stronger than she looked. It was like locking up with one of my guys. 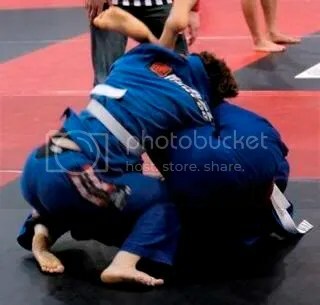 I’d seen another girl try to pull guard on her and get squashed, but she started trying to throw me, so I thought, “Why not?” Did commit to it, but it did no good. — Edit: watching the video, you can see her try to throw me. It looks like she does, though I had actually tried to pull guard there from the side, which in hindsight was a bad idea. So she got the points for the takedown. Whatevers. — I was tired. Could hear Scott telling me what to do, but couldn’t do it. Felt like I was rolling the same as last Saturday. She was doing anything she wanted. She got north/south, and Scott was telling me to go for the single leg, so I turtled to go for it but she got my back. Did trap one hook from getting in, and did eventually get to her guard. 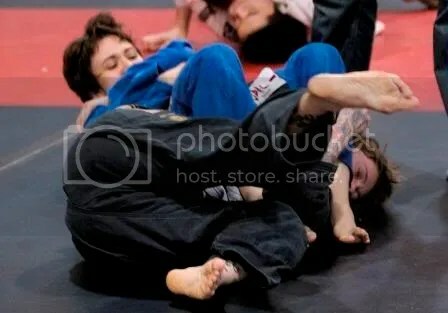 Tried the guard break from Thursday, but didn’t really have her arms controlled or my weight forward on her, and she locked on to my sleeves and slung up for the armbar. Had to tap. I rode up with the guys, but I’m going back with my parents, so I had to leave earlier with them. Missed some of the guys’ gi matches. Still completely amped up. … Talked to Adam later, and he said John won 3rd in his gi division (and the match he lost, it was only by 1 pt). I got a shiny, and I learned a whole lot about my jiu-jitsu, other girls’ jiu-jitsu, and tournaments in general, so I’m marking it down as a success all around. Ran in to a friend from TKD, Mike Z. (He’s the guy who used to smile when you finally hit him hard enough in sparring.) Almost didn’t recognize him in street clothes! He started training BJJ after he left, and he’s a brown belt now. (Holy cow! — Edit: not sure exactly what he’s training, though it looks like a cross between JJJ and BJJ with striking. Whatever it is, he’s good at it.) 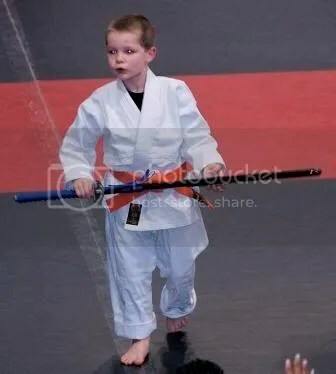 He was competing in gi, but I didn’t get to stay and watch him because my dad and uncle had to leave.